When ordering a shed it is important you measure the space you have first. 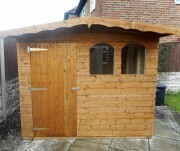 Our sheds are measured from the size of the roof. Choose your shed size from the options shown in the list. 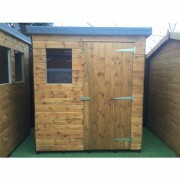 Choose your range of shed standard/heavy duty. The door can be on the front of the shed (for example 7 X 5, the front of the shed would be the 7′ section) on the left or right. The amount of windows depends on the shed size. 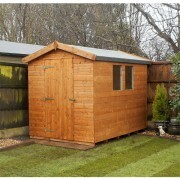 This information can be found when selecting the shed size. 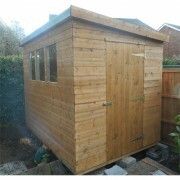 We can remove your old shed for a charge. Please call for a quote to add this on to your order. We offer an additional service off laying a flag base. Please call for a quote to add this on to your order.